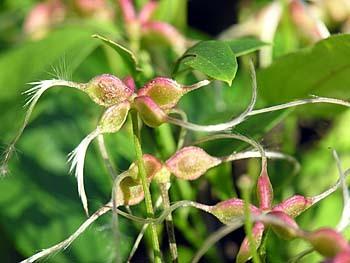 Clematis terniflora. Richard Payne.Falmouth, MA, 9/3/2007. 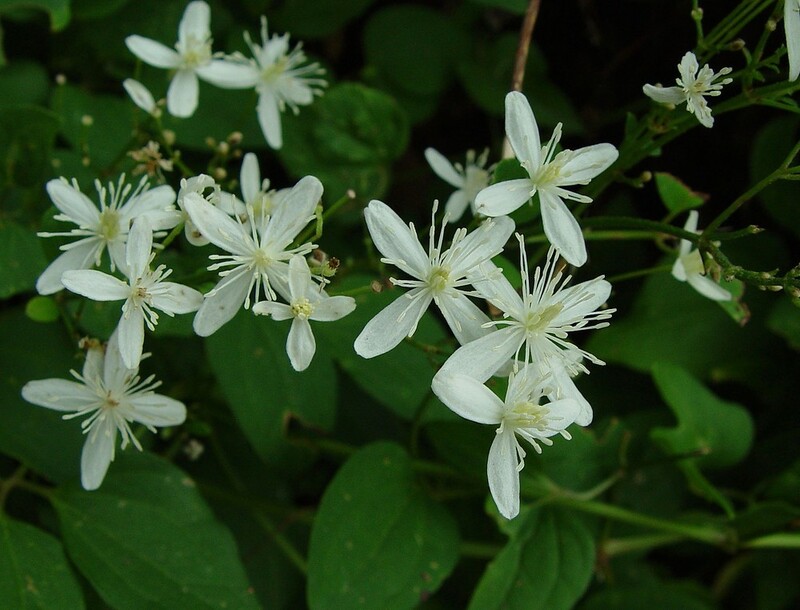 Clematis terniflora is a scarcely woody climbing vine 2-3 m long; bark becoming pale brown, shredding. Clematis terniflora.chalk. richmond.edu (Accessed 12/2014). 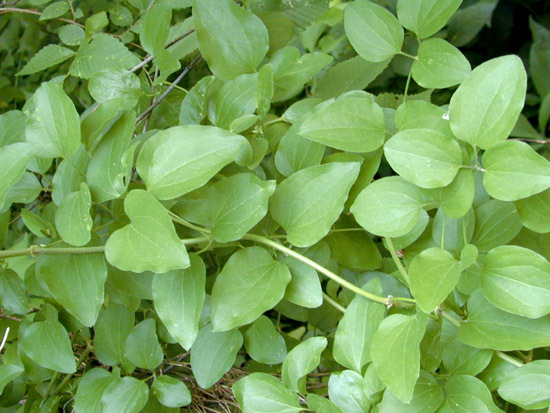 Leaves opposite, 5-parted stalks of leaf and leaflets, elongate, twining or sinuous, used for climbing, leaf distantly 5-parted, leaflets hairless, 5-10 cm long (Scheper 2007), leathery, dull, dark green above, paler below, bluntly triangular to egg-shaped, tip blunt to pointed, base rounded to lobed, often 3 leaflets together at tip, 2 others further back, veins palmate at base, loop-connected, margin entire. Clematis terniflora flowers. By Arthur Haines. Copyright © 2018. New England Wild Flower Society. 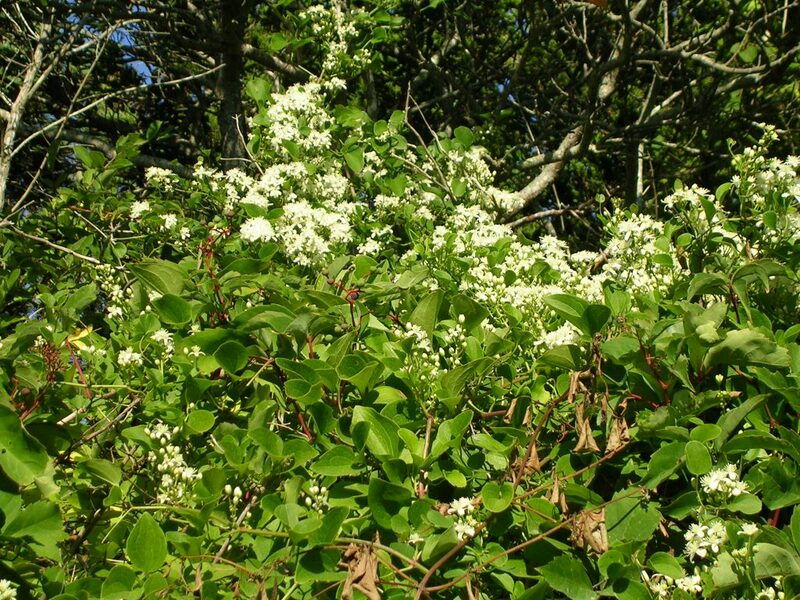 gobotany.newenglandwild.org (Accessed 1/2018). Flowers white 2-3 cm wide, radially symmetrical, all parts free, fragrant, no petals, sepals 4, petal-like, hairy on margins and back (use lens); stamens numerous, conspicuous; ovary superior, pistils numerous; inflorescence branched with numerous flowers; blooms July-Sept.
Clematis terniflora fruit clusters. ©2013 by Will Cook. Carolina Nature. carolinanature.com (Accessed 1/2018). Fruit dry 1-seeded, an achene, tipped by the elongate, plumed style, like feathery tail, 2-3 cm long; fruits clustered like dandelion heads (Scheper 2007); maturing in fall. Habitat: Escaped from cultivation into open areas, climbing on fences and other low vegetation. Can be very aggressive.